The Skeptical Review: The SGU: a live recording. The SGU: a live recording. 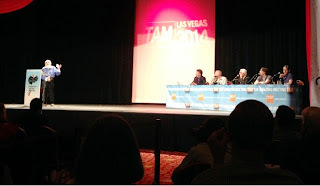 I attended the Skeptics' Guide to the Universe live recording on the second day of T.A.M. The panel consisted of the Novella brothers, Evan Bernstein, and special guest Rogue Banachek. Banachek dressed like a million bucks and fit right into panel. He's a consummate professional. Actually, it was quite clear the SGU is a well-oiled machine. Everyone was quite comfortable behind the mic and on the stage. I am wondering how the episode will be edited and how it will come across on the released podcast. In particular, the visual put up on the twin screens obviously won't be viewed by the listener. Also, there were a number of audio/visual glitches on some of the slides with which T.A.M. as a whole has been riddled. Luckily, none of the glitches got in the way of the recording. Dr. Novella discussed a study where people generally chose being electrically shocked than be left alone with their thoughts for 15 minutes. The panel discussed how the study could be skewed by the pool of subjects picked from a public place, and Banacheck pointed out being voluntarily left alone with one's thoughts might be tougher than being told to be left alone with one's thoughts. Evan shared a recent story of the pro-U.F.O. folks making a big deal out of Buzz Aldrin reporting back during Apollo 11 an anomalous object. The Rogues discussed reporting a strange observation is not the same as reporting seeing an alien craft. Jay's news piece was basically a comic bit. Jay was reporting on an Indian guru whose followers think is in deep meditation, but is much more likely deceased. Jay was about to go into a bad Indian accent, which turned into a bit of a JREF intern having Jay do a test and sign document to be permitted to do his accent. It was cute, but went on two beats too long. Bob reported that some initial exoplanets that were initially thought to be within the Goldilocks zone for life actually do not exist. These planets were actually just within the noise of information from early exoplanets studies. Bob did a good job of it. It is a good example of an evolving field of study. James Randi made a truly impromptu appearance on the episode riffing off the Buzz Aldrin story that even Astronauts can be wrong, and shared how Astronaut Edgar Mitchell is a highly gullible believer in Uri Gellar. On a highly positive note, the Rogues briefly discussed how the B.B.C. has introduced a new policy of training its journalists to not give false balance in its stories but proportional balance. Therefore, instead of having equal space to science-based climatologists versus proponents that climate change is a hoax, reporters should write the story based on the science. This led to a discussion of the shading scale of journalists' integrity. Stories with no skepticism or science; stories with a token skeptic; then to false balanced and finally proportional reporting based upon the evidence and scientific consensus. The recording ended with science or fiction which we both got wrong. But, it made the Editor's day to get to play along live with science or fiction. At least we were in good company as the panel was all wrong too. Chalk up a win for Dr. Steve Novella. The Rogues were joined by Mae Moon who I think won the honor to be on the episode. Overall, I thought it was an enjoyable hour. I have not been listening to the SGU regularly, and this event has not convinced me to put it in my regular rotation again. Yet, it was fun. The show is quite polished and would recommend it to anyone who wanted one stop shopping for weekly skeptical content. Dr. Stuart Robbins is doing twice daily T.A.M. updates on his Exposing PseudoAstronomy, which it is recommended one seek out if you want to follow the events of T.A.M. with a brief lag time.